It is astonishing to think that this book was published as far back as 1991, or that Barrie is no longer with us, but then all good things come to pass. This book is one answer to the question that always comes up when you put a bunch of pike men in a pub - just who were the ten greatest pike anglers? Well, if you want to join in the argument with a chance of winning, you should read Barrie and Malcolm's answer, in this slim, but attractive volume. 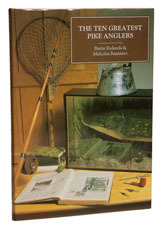 I should stress that this book is about the ten greatest historical pike anglers - if you want to read about the living, then you need Barrie and Malcolm's companion volume, The Great Modern Pike Anglers. Each great gets roughly ten pages, with all the expected dates thrown in, a brief biography and the reason why the authors believe they belong in the list. Where likenesses exist, you also get a line drawing portrait. Read it and then go in with guns blazing. Just watch out for the one with the beard.